What do you do to celebrate Mother’s Day? Perhaps you decorate your home with flowers or are lucky enough to be showered with chocolates? Personally, I enjoy both of those things but I also like a bit of good old crafting to make me feel loved! There’s something about a hand made gift that makes it extra special, especially when it’s made by your toddler. 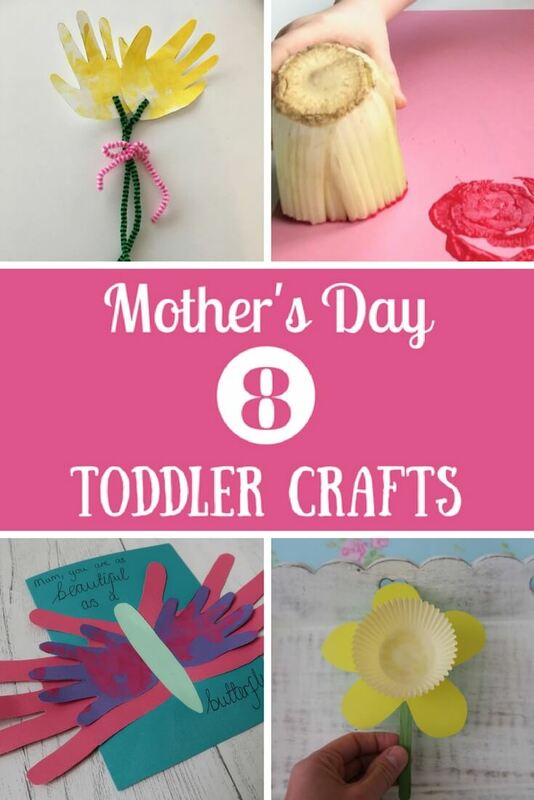 So, with that in mind, I’ve put together a list of eight Mother’s Day crafts for toddlers. 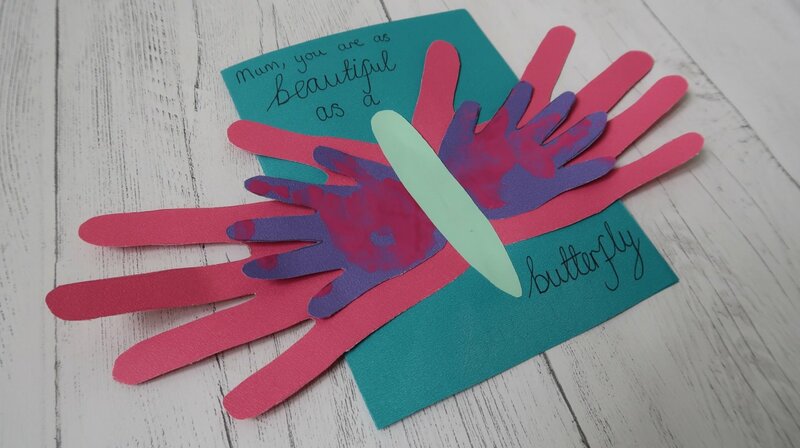 I couldn’t not include this butterfly handprint craft activity that I did with M a couple of weeks ago! It was really easy to do and I used recycled file dividers for the card. Fun and environmentally friendly! You could either present this as a card or stick it to a larger background and frame it. 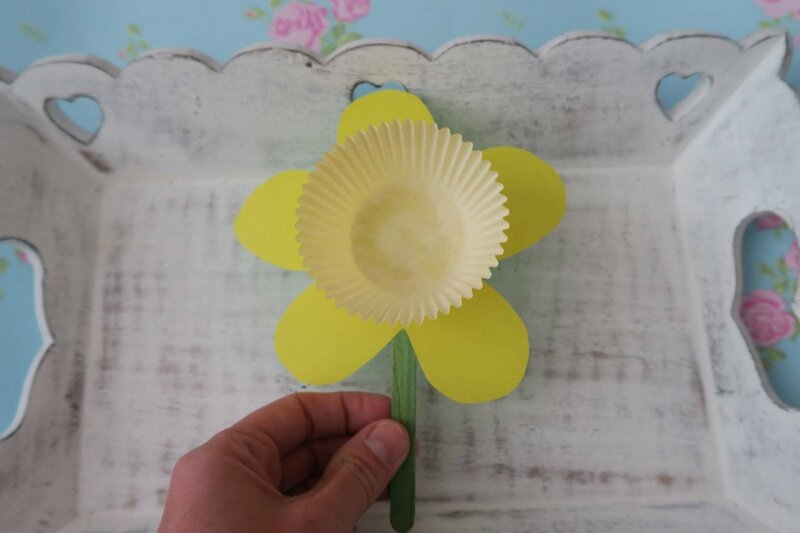 This mega easy daffodil craft is perfect for toddlers to try their hand at – with just three parts to put together, it couldn’t be simpler! Jess shared this lovely canvas craft and says: My little ones made this canvas print. It has my sons hand prints and my daughters food prints so brings them both together in one picture and its a lovely keepsake. 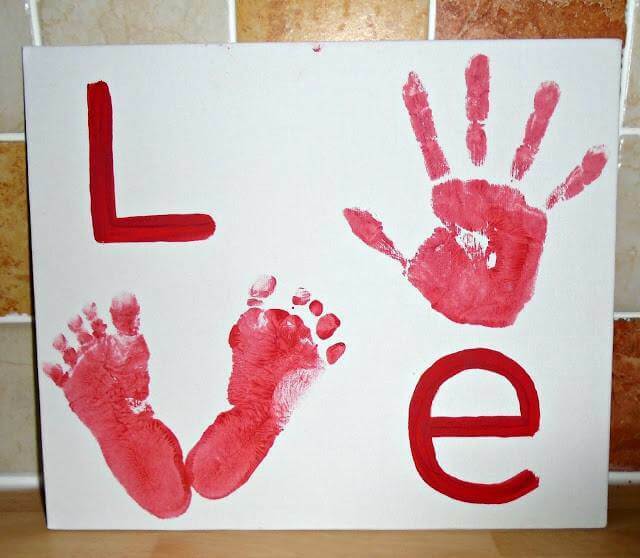 There are so many different pictures you could make using hand and foot print designs too! Victoria shared this beautiful and easy-peasy tulip craft with me. 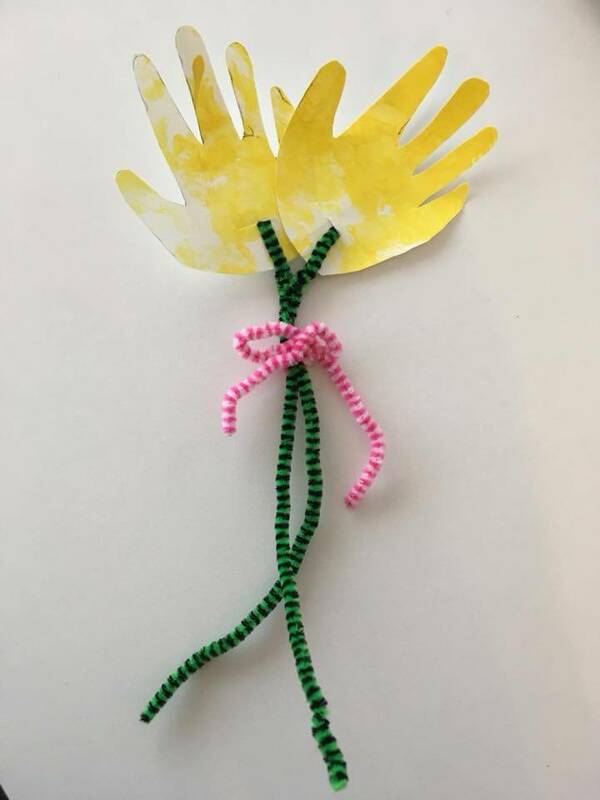 Make some yellow paint handprints and cut them out, attach green pipe cleaners and you can make a small bunch of yellow tulips, tie with a ribbon – voila! 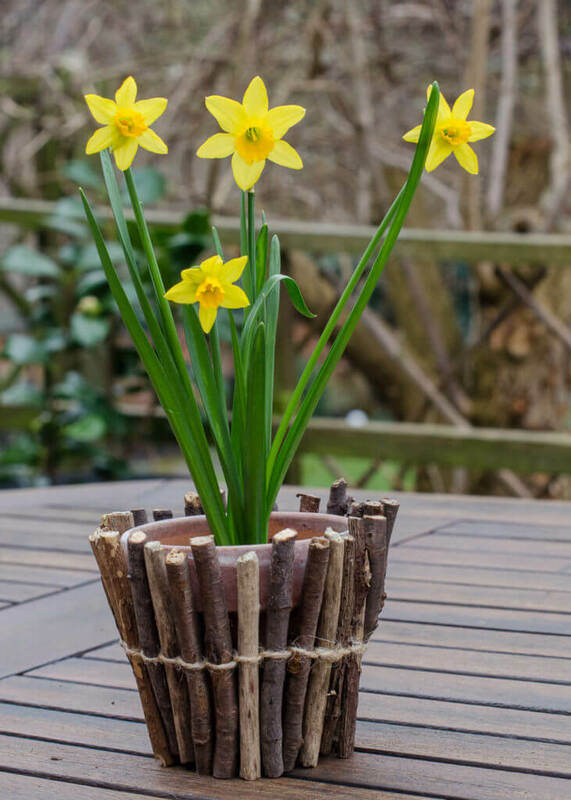 These twig-wrapped flower pots look really smart. You could plant some seeds or bulbs together as a Mother’s Day activity of give one to Mum already planted. Either way, they’re sure to make Mum smile! 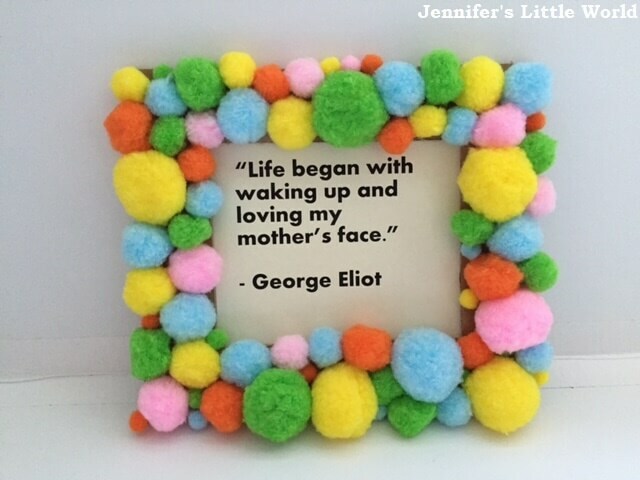 This pom pom photo frame looks great and really easy to create! You could use any colours you like depending on what you’re planning to put in the frame, or choose Mum’s favourite! How clever is this idea?! 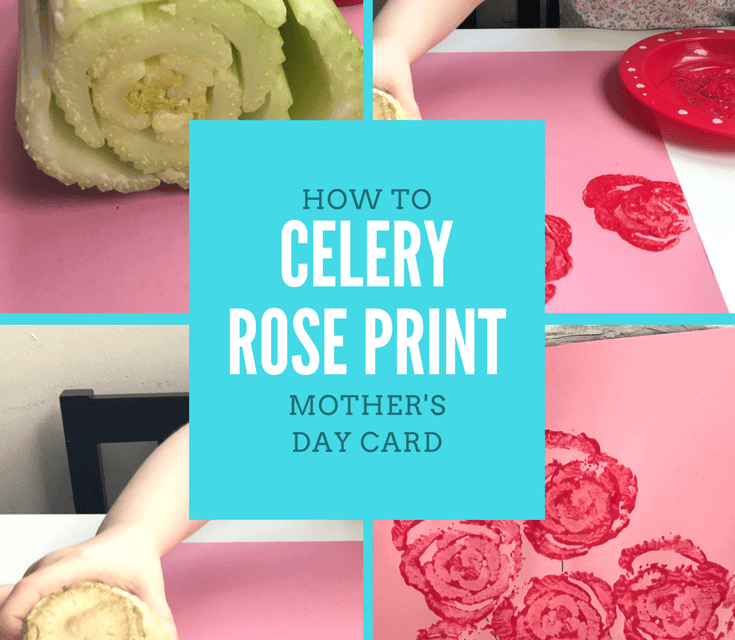 Using celery to print some really effective rose heads. Easy as pie and looks amazing! Definitely one to try. If you’re looking to add the finishing touches to your Mother’s Day gift, then look no further than these lovely Cupcake Gift Tags. Ali has also included a great tip to photograph where you positioned your buttons so that you can take them off to glue them, then easily put them back. Genius!